Three kittens thrown from a truck near Kindersley, Sask., are in good condition according to a local animal welfare group. Volunteers with KAWS Animal Rescue, a nonprofit group, learned the kittens were thrown from a red pick up truck on Wednesday. The cats bounced off the windshield of another car, and survived. "The ladies behind him were going highway speeds, and of course the highway speed was 100 kilometres an hour, so even if he was going half that, it&apos;s still incredible that they survived. "The two orange ones suffered some damage to their teeth where they had to be removed," Nichole Deck, from KAWS Animal Rescue, told CBC News Friday. "[They had] split open lips, and that&apos;s about it." According to Deck, it happened on Highway 21, about five kilometres north of Kindersley. The motorist who was driving behind the truck, and saw the animals hit her windshield, stopped to rescue them. That person, along with others who stopped, managed to find all three kittens. The cats were estimated to be about eight months old. The rescue group was able to get veterinary care for the kittens and, on Friday, said that the animals would be OK and have already been adopted into new homes. "We have no idea who did this horrible act of cruelty," the animal welfare group said on its Facebook page. "The police have been notified but they have told us that they can&apos;t really do anything with such little information." 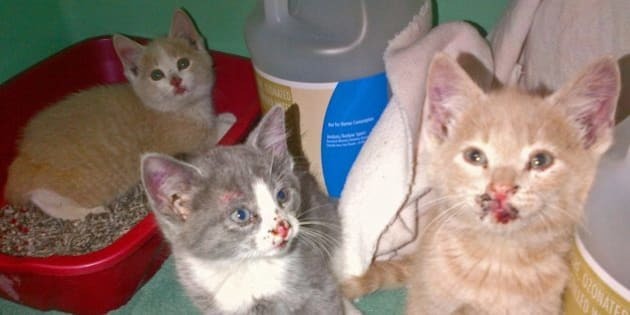 The Kindersley incident with kittens follows another animal cruelty case, a few weeks earlier, when nearly two dozen cats were dumped on a property just outside Prince Albert. Some of those cats had died from having been stomped on.